David Randall, author of The Universal Journalist, presents 13 in-depth profiles of the best journalists who ever lived - nine Americans and four Britons, ten men and three women, whose lives were full of adventure, wit and the ingenuity to bring the story home. Each profile describes the reporter's life and major stories, how they were obtained, and their impact. Packed with anecdotes, and inspiring accounts of difficulties overcome, the book quotes extensively from each reporter¹s work. There's also a chapter on the history of reporting, charting the technologies and attitudes that made it the way it is from the invention of the telegraph to the Internet. 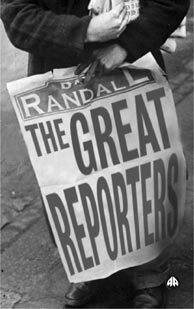 The Great Reporters is not just the story of 13 remarkable people, it is the story of how society¹s information hunter-gatherers succeed in bringing us all what we need to know.